Draft: 2009 - Phillies - Free agent - Out of the D.R. In 2010, the Baseball America Prospect Handbook rated Domingo as the 10th-best prospect in the Phillies organization. They moved him up a notch, to #9, in the spring of 2011. And they moved him up more, after the Astros acquired him, to 6th-best in the offseason before 2012 spring camps opened. He was at #11 in the spring of 2013, and at #8 in the winter before 2014 spring training. Domingo speaks English well, which has helped him adjust to pro ball. In 2014, Santana was named to the SiriusXM All-Star Futures Game. 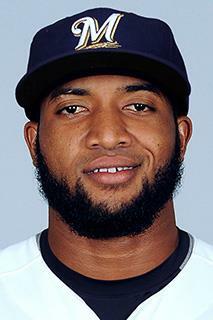 The fact Domingo Santana was traded to the Astros several years ago came with a certain amount of irony, considering that his father, also named Domingo Santana, was signed by the Astros as a teenager by legendary scout Julio Linares, referred to by Latin players as "El Capitan." Santana's father's career, which began as outfielder and ended as a pitcher, didn't quite work out as well as that of his son, who was called up by the Astros earlier this week. He's one of the team's top prospects. "After he got released and stuff, he went back to St. Thomas [U.S. Virgin Islands] where he had a sister and he just stayed there," Santana said of his father. "He got me a visa so I could go over there and get a better life and so I could learn English." Santana, who was born in the Dominican Republic, spent much of his childhood in St. Thomas, beginning with kindergarten and ending after his first year of high school. It was at that point he quit school and went back to the Dominican to begin working out at the Phillies' academy there. His mother, Aida Maria Caraballo Santana, lives in Yonkers, N.Y., and Domingo also spent a few months living there shortly after he signed with Philadelphia. His mother is currently in Anaheim watching the Astros play the Angels. They used to hang out at the car wash in the Dominican Republic and dream of being teammates. When that came true at the end of January 2016, Domingo Santana and Rymer Liriano began to dream bigger. They live less than two minutes apart in Santo Domingo and played together over the winter for Tigres del Licey, with Liriano and Santana manning the corners around center fielder Leonys Martin of the Mariners. Away from the field, Liriano and Santana pushed each other in early morning workout sessions with the same strength and conditioning coach. They spent time at the beach and at the movies, and made plans to share a Spring Training apartment with two others in Brewers camp, infielder Yadiel Rivera and catcher Rene Garcia. Many days, they spent time in the sun at the car wash, talking baseball. "I'm really, really, really ready to play in the big leagues," Liriano said. "He's a talented player. I think he's a high-impact player," Brewers manager Craig Counsell said. "I'm going to rerun this statement, but he's [attempting to] turn his talent into skills. He's in a good place right now, offensively. Defensively, Liriano has speed (he stole 68 bases in 2011) but profiles more as a corner outfielder," Counsell said. Said Santana: "He looks like a Wily Mo Pena, but makes way more contact. He has tremendous power. He can run. He can throw. He can do everything." Santana is rooting for his buddy to stick with the Brewers. "You want to see your friend be at the same level so we can talk about Major League Baseball, and not Minor League Baseball," Domingo said. "There's nothing [left] to talk about in the Minor Leagues. It's living your dream, talking about facing [Clayton] Kershaw and all those guys. It's really fun." While Liriano fights for a spot, Santana's was sealed Feb. 12, 2016, when new general manager David Stearns traded left fielder Khris Davis to the A's for two prospects. The Brewers subsequently moved Ryan Braun back to his original outfield position, left field, to open right for the strong-armed Santana. Santana already knows what will be going through his mind when he steps to the foul line at Miller Park for his first big league Opening Day in 2016. "My dad and my brother, because I really miss my brother," said Santana, the Brewers' right fielder. "I know he can't be here watching me and stuff, but all God's plans aren't perfect. So I just can't get too much in my head about it. Just enjoy life every day." Domingo's father was a strong-armed outfielder and pitcher who played in the Astros' Minor League system. After his playing career, he settled in St. Thomas in the U.S. Virgin Islands, where the younger Domingo learned English, played trombone in his school marching band and learned the baseball skills that earned him a contract from the Phillies in 2009. Until March 2016, Santana had not spoken publicly about his brother, Yoangel, who was 18 when he died from a gunshot wound the same year Santana signed. Yoangel was at a party, Santana said, when shots were fired and he scurried for safety. "Eventually, when he started walking, he started getting dizzy," Domingo said. "And he just like fell down, and by the time they found him, he already lost a lot of blood. When he got to the hospital he was alive, but after that, he just didn't make it." On the brink of his first full Major League season, Santana is a breakout candidate for a Brewers team going through a rebuild -- and perhaps a poster child for that process. The slugging, strong-armed Santana was acquired from the Astros in July 2015 for Carlos Gomez and Mike Fiers. On Aug. 21, Santana became the first of the newcomers called up to Milwaukee. "The first impression is that he just looks the part," said Ryan Braun. "Big, tall, athletic, 6-foot-5 and 220 [pounds]. Projectable body. He has all the tools you look for. So my first impression was that physically, he looks the part." Manager Craig Counsell says that Domingo has possessed a surprising level of baseball smarts. "The thing that impressed us all was his ball/strike recognition," Counsell said. "You feel like it's a skill that can still grow. I think we've seen signs of it in Spring Training, that it's going to grow. It's generally a trait that you see as you age, it gets better and better and better. But he's got it, and you get excited about it because you feel like if it keeps improving as we go, year by year, it could get him to a category where he can be a pretty special player." Sept 22, 2017: Like a vicious one-two punch, Hurricanes Irma and Maria slammed into the U.S. Virgin Islands, leaving in their wake vast damage that literally hit home for Domingo Santana. Santana spent much of his childhood in picturesque St. Thomas, where his father, a former professional ballplayer by the same name, still resides. Before the series opener against the Cubs, Santana said he has been in near-daily contact with his dad, who weathered the storms safely but is without power and busy cleaning up significant property damage. "Everybody in St. Thomas is missing half of their roof," Santana said. "There is flooding all around him. The airport is not working now and I don't know what is going to happen. It's hard to communicate because there is no power and they are using cars to charge their phones. I just hope there is still enough gas on the island to keep that up." Santana said the U.S. Coast Guard was assisting his father and other residents with recovery efforts. Thousands of miles away, Santana is feeling somewhat helpless, and is doing his best to remain focused on a pennant race. "It's hard, but every day this is my job," he said. "I have to come out here and try my best. Sometimes the game helps you from focusing on everything happening outside. This is an important series." March 2009: The Phillies landed Santana as a free agent for a $330,000 bonus. He was signed by scout Sal Agostinelli. August 15, 2011: The Phillies sent Santana to Houston to complete the trade in which Philadelphia got OF Hunter Pence. July 30, 2015: The Brewers sent Mike Fiers and Carlos Gomez to the Astros in exchange for international signing slot No. 76 and four prospects. The four prospects going to the Brewers: RHP Adrian Houser, OF Brett Phillips, Santana, and LHP Josh Hader. Dec 21, 2018: The Brewers traded RF Domingo Santana to the Mariners for LF Ben Gamel and RHP Noah Zavolas. Jan 11, 2019: Domingo and the Mariners avoided arbitration agreeing to a one-year deal worth $1.95 million. Santana is a developing power hitter with raw strength from a big body. His bat speed is excellent and his most notable tool. He has power to the opposite field (which is right-center field for him), not really being a pull hitter. The ball makes a different sound coming off Domingo's bat. He can really turn that baseball around with his combination of impressive bat speed and tremendous leverage. Santana strikes out a whole lot, like most power hitters. There are a lot of swings-and-misses due in part to his really long arms. And it is something he exacerbates with a high hand position, which forces the bat to travel a long way to get through the zone. But he is maturing as a hitter, adjusting to the way he is pitched and had improved his pitch recognition. And he is dialing back his aggressive approach a bit. He still needs to improve his contact rate. Breaking balls away ate Domingo up in 2012. And in 2013, Texas League pitchers had success busting him on the inside corner. Domingo can look terrible vs. secondary pitches and can also be beaten by hard heat. That is a deadly combo for a hitter. Domingo mostly hits the ball up the middle and doesn't get pull-happy. If he can learn to consistently make contact he could become a big league regular in the mold of Jermaine Dye. He needs to manage the strike zone better and see more pitches per at-bat. But he has toned down his aggression some. "Failure sometimes can be our best learning curve," former Astros manager Bo Porter said in 2014. Santana holds the longest recorded home run for the Brewers. It was July 26, 2017, vs. WASH: Distance: 476 feet. Nationals Park has housed plenty of its own sluggers, from Bryce Harper to Anthony Rendon to Ryan Zimmerman. But it was the visiting Santana who etched his name on top of the ballpark's list of longest home runs. As of the start of the 2019 season, Domingo's career Major League stats were: .261 batting average, 54 home runs with 163 RBI in 1,159 at-bats. Domingo plays an impressively athletic right field. He certainly has the arm for the job. He reached 90 mph off the mound as an amateur, so his arm is very strong. He takes good reads, jumps and routes to the ball. And he already has plus range. He's playing solid defense out there. Domingo is a real big guy, yet he can run the 60-yard-dash in 6.7 seconds. In 2017, Santana stole 15 bases for the Brewers. September 2010: Santana went on the D.L. the last week of the season. April 5-16, 2012: Domingo spent the first couple of weeks of the season on the D.L. June 3-10, 2012: Santana was on the D.L. with a hamstring injury. April 18-26, 2013: Domingo was on the D.L. with a pulled hamstring. August 18-28, 2013: Santana was on the D.L. May 19-June 3, 2016: Santana was on the DL with right shoulder strain. June 8-August 19, 2016: Santana was on the DL with right elbow soreness.